Due to an increase of accidental overdose deaths (largely due to Fentanyl being sold to and used by unknowing buyers) in our province and country, HIVWY (along with other HIV organizations in the province) has partnered with Alberta Health Services to educate, train and empower clients, drug users and service providers to take a stand against accidental overdose deaths. Drug use in our province has become more risky, as the drugs have become more potent, less expensive and easier to buy or manufacture. As the rate of drug use increases, so does the risk of an accidental overdose which can result in death. HIVWY is committed to the health and safety of all of the communities in our region. We believe that training individuals how to recognize, assess and treat an overdose is a key part in providing quality care, support and education to the individuals we serve, as well as the community as a whole. August 31st, 2015 marks International Overdose Awareness Day. 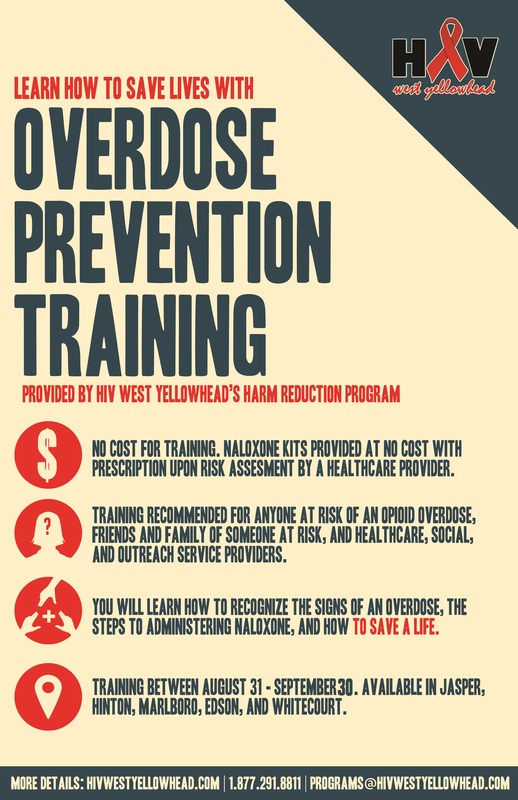 HIVWY will be hosting a training session on Overdose Prevention as well as talking about the Naloxone program that is being rolled out across the province. Come join us at the Marlboro Community hall on August 31 from 2-4pm to talk about this program, complete the training and learn how you can save a life. All participants will be provided with snacks and beverages as well as a certificate for taking the Naloxone and Overdose Prevention training. To register for this FREE training program click here. We are happy to arrange an alternative training session for a private group as well. Please fill out the form on the registration page to book. Thanks for your kind words! I live in British Columbia, Canada not the US Thanks for posting new links and inoiamrtofn I look forward to exploring your blog.